Firebug Farms is a family homestead located in Bridgewater, Michigan (Manchester address). Our philosophy is rooted in organic farming practices, breeding for sound conformation, and milk production. Naturally, this has led us to learn a great deal about goat care, genetics, and milk products. 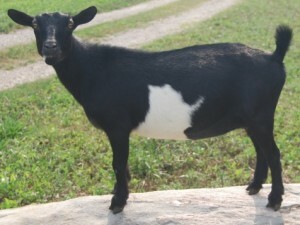 We believe strongly that a goat with good conformation will produce over the long years to provide milk. We are members of ADGA, AGS, NDGA, ANDDA, and MDGS. We started this adventure with Alpines and “Mini-Alpines”. The Mini-Alpines led us to the Nigerian Dwarf breed and these little goats have impressed us tremendously with their milk production and the wonderful cheese we make from it. Our goats are from registered stock so that we can track their genetics in order to provide the best goats to the community. We enjoy taking care of these darling animals that are providers to our family. We hope that you appreciate their attributes as much as we do, and would love to share any information about the breed that we can. We test for common goat diseases to ensure our herd health is the best it can be. We routinely performing testing for CAE, CL, Johnes, and Brucella. Please research these diseases, and we encourage everyone to obtain tests on their goats prior to them coming home. CAE and Johnes can effect the lifespan of the goat. CL is a bacteria that can be transmitted to humans and lives in the soil. Johnes is a bacteria that may be linked to Crohns disease in people. Brucella (Brucella melitensis) that humans can get was eradicated in the States many years ago (reference CDC website) but we test for Brucella ovis ( to ensure our does do not have issues such as abortions). We do not test aggressively for Brucella ovis at this time.